Fulham earned their first clean sheet of the season as they played out a goalless draw against Newcastle on Saturday afternoon. The first-half was rather uneventful and neither side was able to fashion a clear-cut opportunity on goal. Jean Michael Seri came the closest to opening the scoring with a free-kick from around 25 yards out, but Martin Dubravka was quick to scamper across his line to keep the effort out. Goalmouth action continued to be at a premium in the second half. Newcastle looked the more threatening of the two sides, but they were often unable to find their way through a deep-lying Fulham defence. The Magpies' had a penalty claim turned down with 13 minutes left on the clock when Joe Bryan appeared to drag down Kenedy in the box. The action finally picked up during the closing exchanges and Fulham began to push for a late winner. Aleksandar Mitrovic had arguably the best chance of the game when the ball was squared to him inside the 18-yard box, but the former Newcastle striker's effort was blocked by Jamaal Lascelles with what appeared to be his arm. 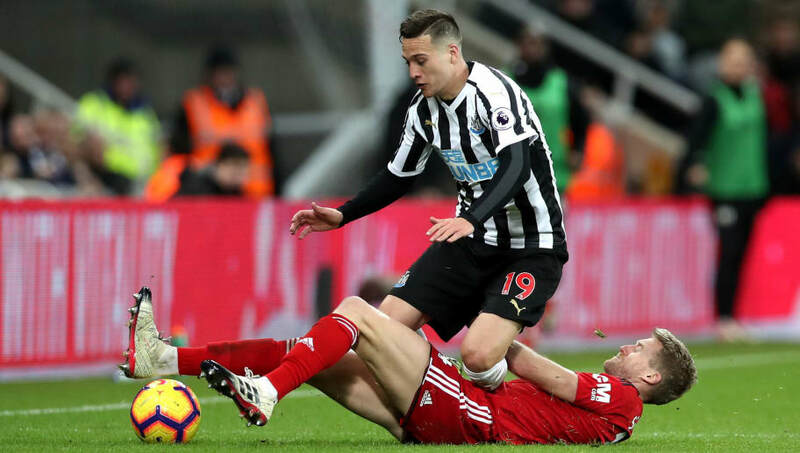 Lascelles was called into action again right at the death, producing a stunning slide tackle to stop Aboubakar Kamara, who looked to be clear through on goal. ​​Newcastle were fortunate to come away with a victory against Huddersfield last weekend, so they had to make sure that they upped their performance levels this time around. Somehow, they ended up looking even more unconvincing. Their lack of creativity and invention in the final third proved to be their undoing and Sergio Rico was rarely tested in the Fulham goal, which will be incredibly frustrating for Rafa Benitez. After an impressive run of results in November saw them move out of the relegation zone, they could end up being dragged back into the relegation dogfight if they don't start bucking up their ideas. Starting XI: Dubravka (6); Manquillo (4), Lascelles (6), Schar (5), Dummett (6); Ritchie (5), Diame (5), Ki (6), Atsu (4); Perez (5), Rondon (5). Substitutes: Kenedy (5), Yedlin (6). No one really stood out from a Newcastle perspective, but Lascelles' two interventions in the closing exchanges proved to be utterly vital. He had a few shaky moments on the ball, particularly in the first half, but he was there in the moment when it mattered most for his side - something he's done countless times in the past. It was a surprise to see Manquillo starting over DeAndre Yedlin and that decision ended up backfiring on Benitez. The Spaniard looked out of sorts down the right flank and his final ball often left a lot to be desired. He was hooked off for Yedlin in the second half, who immediately offered more going forward. There's only been one talking point for Fulham so far this season - their utterly dreadful defensive record. There will be much sterner tests to come, but Fulham supporters can rejoice in the fact that, for the most part, their side looked rather solid at the back. Newcastle were restricted to half chances all afternoon and the switch to a back five seemed to work out. Now that Claudio Ranieri is starting to solve Fulham's defensive woes, he's going to have to figure out how to get them scoring again. They've now only bagged two goals in their last five matches. Starting XI: Rico (6); Christie (6), Odoi (6), Ream (6), Mawson (7), Bryan (6); Chambers (7), Seri (7), Cairney (6); Schurrle (4), Mitrovic (6). Substitutes: Kamara (6), Ayite (5). Seri hasn't had the smoothest of starts to life in the Premier League, but he put in one of his most impressive performances in a Fulham shirt this time around. The Ivorian covered plenty of ground in the middle of the park and he demonstrated the sort of quality on the ball that Fulham supporters would have been expecting when he joined the club in the summer transfer window. Seri was excellent today. Would love to see us regain the confidence to get him higher up the pitch now that he seems to have found his belief again. Schurrle certainly wasn't at his best on this occasion and he was culpable of giving the ball away far too often in the final third. He also failed to provide enough support for Mitrovic at the top end of the pitch and the Serbian striker became far too isolated as a result. Both sides are back in Premier League action on Boxing Day. Newcastle make the daunting trip to Anfield to face Liverpool whilst Fulham host Wolves at Craven Cottage.